Minnie Lou paved a way for young women to enter the arena of livestock breeding and management programs. She was the one of the first women to receive a degree in animal husbandry from Oklahoma State University and the first female member of the Intercollegiate Livestock Judging Team. She was the first female president of the American Angus Association and the recipient of numerous awards for her vision and dedication to the improvement of beef cattle. 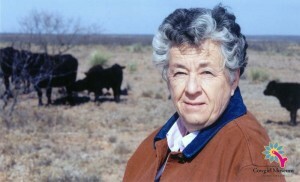 She owns and operates Bradley 3 Ranch with her family, and is considered a leader in the beef industry. For the past fifty years, she has partnered with the Ranch Management Program at Texas Christian University in Fort Worth, Texas helping young ranchers learn the industry.